distant oasis city for the first time in history. Travel Times are considerably down. 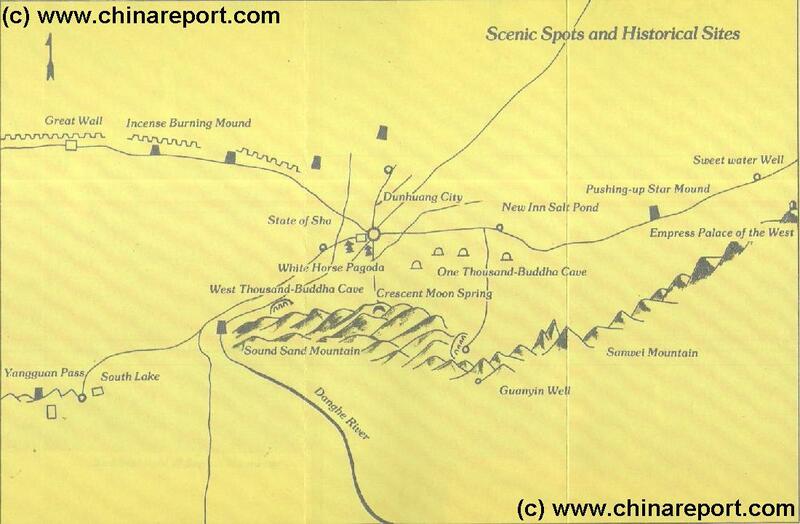 The below Schematic Map Drawing dated to the 1950's gives a clear overview of Dunhuang City and wider surrounding area of far Western Gansu Province in China. Today's situation in Dunhuang and Area has changed only minimally from the Old Situation as depicted in this Map. Main Roads as depicted are still in use and most landmarks marked on this early Map can still be visited. The Most notable changes to Dunhuang have occurred in the last 10 to 15 years, when population rapidly expanded. Recently, through the "Opening Up the West" Policy of the Central Government, development has picked up. Music Bonus - "Tunhuang"- By Kitaro. First of all highways have been expanded and modernized, touching Dunhuang as well as the entire province. For visitors to the outlying Landmarks & Monuments of Dunhuang this means greater ease of travel through the area on better, less dangerous freshly paved roads. Last but not Least many new Hotels, a modern City Hall (on West Street) and better services have lifted the small silk road city into a surprising modernity, offering plenty experiences to visiting Tourists and Travelers. Section of the Great Wall of China. In addition there are the spectacular features of the Sand Dunes to the South of the Village and some considerable smaller sites to visit. Ranked absolutely first among Dunhuang's Monuments are the world famous world cultural heritage site and ancient Buddhist Holydom of The Mogao Caves, described by Silk Road traveler Marco Polo in his travel book "Il Millione". These are located due South-East of Dunhuang. Second in Fame are the Jade Gate or YuMen and nearby remnants of the Han Dynasty Great Wall of China, located due North-West some 110 kilometers out of Dunhuang across the barren desert of the Western-most Hexi Corridor. The Jade Gate is known as the First Gate under Heaven in The West, famed in Songs and Poems. 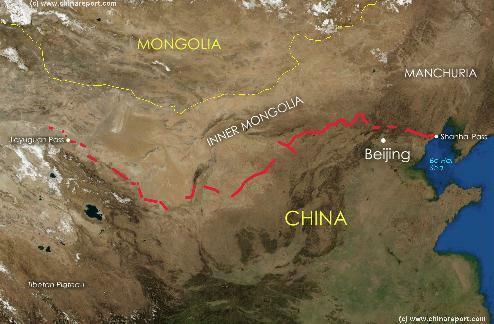 For a long Time, after its first establishment during the Han Dynasty (206 BC - 221 AD) it was the final End of The Great Wall of China in this western desert. Beyond lay only barbarian lands and treacherous roads of the Silk Road which could be traveled through the North Route of the Silk Road in this Region, the one through Kumul (Hami) to Turpan Oasis then Westward to Kashgar. On the other side of the desert plateaux of the Dang River, in the South-West lies the Third Monument in historical importance, the Fortress and Beacon of the Sun Gate, Yang Guan Pass. The Sun Gate Pass was the beginning of the Southern Route of the Silk Road around the sands of the Taklamakan, which lead westward through Khotan, Loulan and Yarkant to Kashgar. The last and fourth Monument and Wonder of Dunhuang are the Mingsha Shan "Sighing Sands" Sand Dunes and its Unique Crescent Moon Spring and Temple. Here one can try a Camel Ride, use a quad or just ones own feet to explore the 100 meter tall sand dunes and enjoy the culture and architecture of the beautiful Crescent Moon Lake. Many other smaller monuments of the Silk Road and Great Wall are dotted around for those who have Time to take in all of the village scenery and history. Among these the Dagoba of the White Horse, the nearby White Horse Temple, the Western Buddha Caves and the Ruins of the Village of Dacheng are all worthy choices for an expedition in the Area of Dunhuang Village.